As with much of southern Africa, the earliest inhabitants of what is now the country of Zimbabwe were the nomadic San peoples, who led a life in search of game and edible vegetation about 20,000 years ago. Later the Khoi-Khoi people, pastoralists with herds, entered the region. The two cultures fused into the Khoisan people, who have shown an amazing degree of adaptation to one of the world’s most forbidding climates: the Kalahari Desert. By approximately 500 the Bantu arrived as the Gokomere people, climaxing the long Bantu migration from the central Sahara, which was most likely caused by the country’s turning into desert and driving out the livestock-herding Bantus. Whether this was the cause of overgrazing or an early example of global climate change is unclear. The settlements at Mapungubwe in the Limpopo River valley date from the 10th century, although archaeologists have found evidence from as remote as the third century. 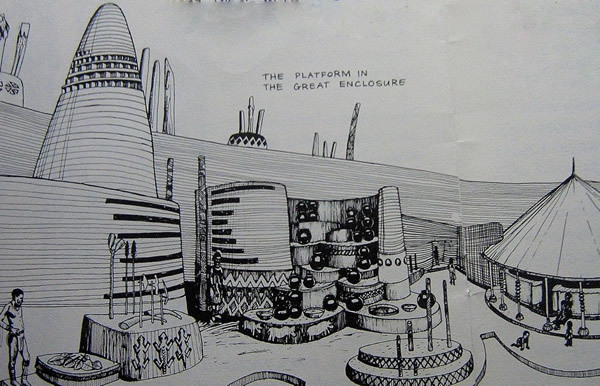 By 1175 Mapungubwe had become the center of a small kingdom whose population was devoted to raising livestock. 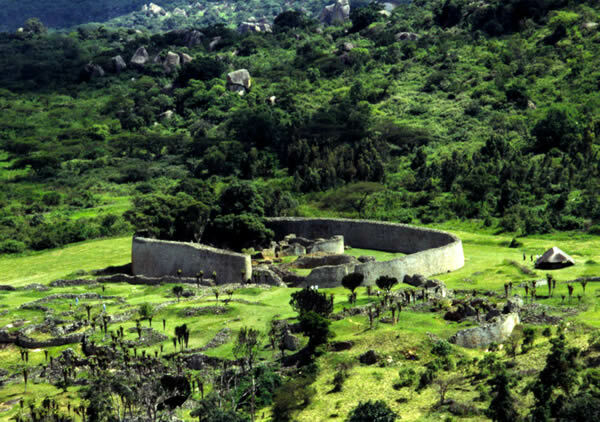 Sometime during this era of Bantu migration to the region, the great stone, cyclopean structures of Zimbabwe, Khami, and Dhlo-Dhlo were built, the Stonehenges of southern Africa. It was buildings like these, and the legends that grew up around them, that led Victorian author H. Rider Haggard to write his classic adventure novels She, King Solomon’s Mines, and Allan Quartermain. John Reader writes, “At the time of its pre-eminence in the fifteenth century, at least 11,000 and as many as 18,000 people are said to have lived at Great Zimbabwe.” Reader notes that Zimbabwe was built between 1275 and 1550. By the 14th century the Bantus had created the Mutapa empire, which would reach to the East African coast at Mozambique. Even before this, Arab merchants were in large numbers in the coastal cities, creating an oceanic trade with what are now Saudi Arabia, Yemen, and east to India in their sailing ships, or dhows. Their voyages would be expertly timed with the monsoon seasons, which still dominate the region today. By the 16th century the Portuguese, with their far more heavily armed caravels, dominated the trade on both coasts of Africa, building castles to protect their trading interests from the African chiefs and Arabs with whom they were in competition. In 1498 Vasco da Gama reached India, thus making Portugal the first of the European maritime trading empires. On his voyage down the West African coast, he had seen Arab dhows picking up the vast amount of gold that the Mutapa empire and the Shonas sent to the coast, a product of the rich gold mining that was the greatest heritage of old Zimbabwe.